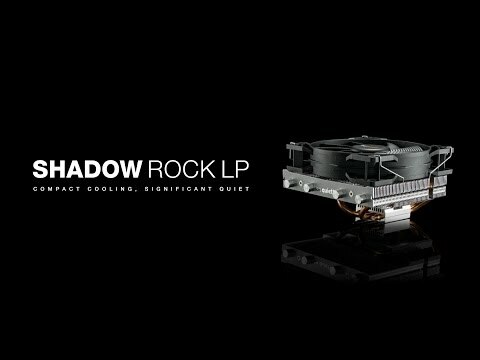 Shadow Rock LP Low Profile Intel/AMD CPU Air Cooler from Be Quiet! • High compact cooling capacity of 130W TDP. • Four high-performance 6mm heat pipes carry heat to the optimal locations on the cooling fins. • A silence-optimized Pure Wings 2 120mm PWM fan supports the best balance of cooling performance and quiet operation. • Nine silence-optimized fan blades with high airflow capabilities reduce noise-generating turbulences. • Durable rifle-bearing technology contributes to a long lifespan of up to 80,000 hours. • Even at 100% full fan speed, overall noise is a scant 25.5dB(A). • Low-profile design saves space and allows easy access to components even within the tight confines of compact PC enclosures. • Design supports mounting from atop the mainboard, greatly increasing convenience. • Attractive design thanks to aluminum top cover and heat pipe caps. • 3-years manufacturer’s warranty. Features • High 130W TDP cooling performance. • Pure Wings 2 120mm PWM fan with airflow-optimized fan blades and durable rifle-bearing. • User-friendly mounting from atop the mainboard. • Four high-performance 6mm heat pipes with aluminum caps. • Premium aluminum top cover. • Impressive silent 25.5dB(A) noise level at 100% rpm. Be quiet! 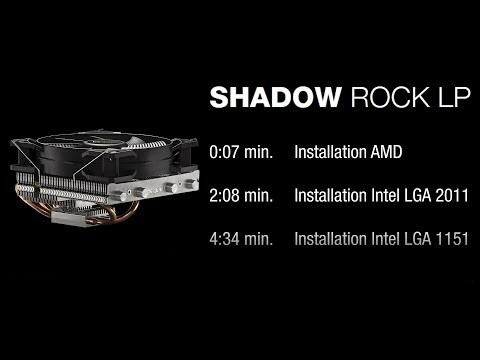 Shadow Rock LP, Low-Profile Top Flow Single Tower CPU Cooler, 4 Heatpipes, 120mm PWM Fan, 130W TDP, Intel/AMD is rated 5.0 out of 5 by 3. Rated 5 out of 5 by Percival from Great performance! This cooler is probably the best I've used, for a low-profile format, and even in mid-30 degrees ambient, on full throttle, the CPU didn't nudge above 50 degrees once, compared to 65-68 with the stock Intel item. Rated 5 out of 5 by JWE1 from from very noisey to silent Product installed easy and silenced an older PC the was hardly used because it was so noisy!